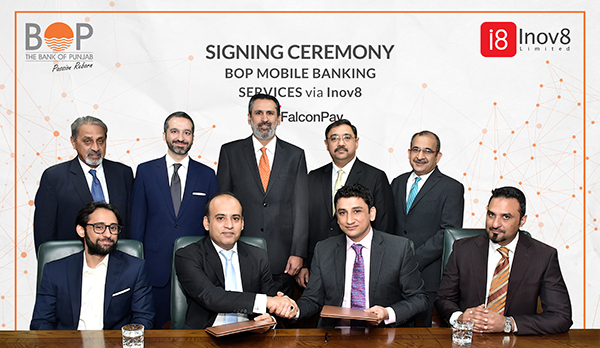 The Bank of Punjab (BOP) has started the implementation of its Mobile Banking App with Inov8 Limited. In line with the objective of providing multi channel banking experience to its customers, The Bank of Punjab aims to launch cutting edge mobile banking services. Based on Inov8’s FalconPay platform, the solution would be available in both Android and iOS based Smartphone App versions. The induction of Mobile Banking services mark yet another milestone in BOP’s digitization drive. Speaking on the occasion Mr. Naeemuddin Khan – President & CEO The Bank of Punjab stated “Enhanced convenience for our customers is the key value addition being offered by the Mobile App”. Mr. Ahmad Shah Durrani – Group Head Retail Banking added “The introduction of the Mobile Banking services is a stepping stone towards offering the best of class digital banking services to our customers. Our goal is total digitization, while offering quality service across more and more channels.” Inov8 Limited’s Co-Founder and Co-CEO, Bashir Sheikh stated, “Inov8 is honored to have been long associated with BOP. With our latest mobile banking product suite, BoP will be equipped to give their customers an unmatched digital experience in today’s rapidly changing environment where primary connectivity is 3G and 4G and the smartphone is the device of choice.” The Bank of Punjab is already running a highly successful Branchless Banking venture – aiming at digitizing government payment flows to the masses in the Punjab province – with Inov8 on the FalconPay platform.